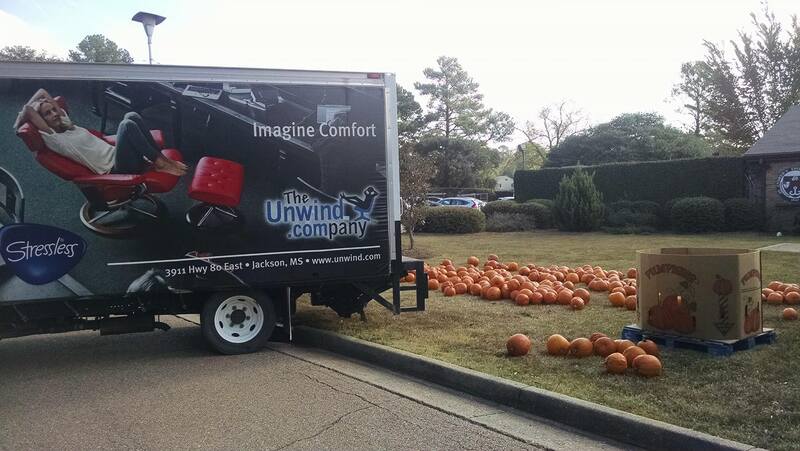 At the beginning of November, The Unwind Company took a day to help feed those in need in the local area. The holidays are fast approaching and there are so many people in need that struggle to put food on the table. This prompted The Unwind Company to partner with a local charity that helps deliver Fresh Food to the needy. This charity is called The Society of St. Andrew. This charity helps rescue more than 20 million pounds of fresh food every year across the nation. They have offices in 11 states and operate nationally through partnerships and volunteers. A few weeks ago, the Society of St. Andrew delivered pumpkins to several agencies, churches, and schools that were planning to send the pumpkins home with children and have baked goods brought back to be donated to soup kitchens, shelters, and other agencies. This way hunger relief agencies have loads of fresh-baked goods just in time for the holidays. The Unwind Company location in Pearl, MS was incredibly generous with their time and resources. They graciously assisted in the delivery, loading, and unloading of more than 10,000 pounds of fresh pumpkins. These pumpkins were baked down by children and families and then distributed to various agencies, including The Salvation Army. The Unwind Company focuses on helping people around the world improve their physical comfort and overall well-being through healthy furniture and ergonomic life-style products. It is only natural that they would so easily lend a helping hand when confronted with people struggling to put food on the table. What could be less comfortable than having to go to bed hungry at night? Stay tuned to this blog for more details about how you can get involved and help end hunger. As the 2016 Stressless Charity Promotion approaches, we will have more details available about how you can donate to this wonderful charity and also save up to $400 off of select Stressless Recliners.